As I wait for the Butterflies to wing their way north to my floral garden, (previous post) I decided to put quilting aside for a week or two and focus on some cute little sewing projects. After all, why would I be given the precious gifts of grand daughters and ignore the possibilities of sewing adorable little outfits? 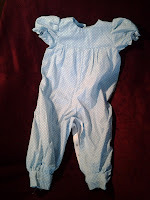 I wanted to make a jumpsuit for the birthday of our sweet 1 year old grand daughter. The blue of this fabric reminds me of her beautiful eyes and I know her mommy loves blue! I began my sewing projects with this little outfit. I'm quite proud of the changes I made in the pattern. I put cuffs on the legs to keep it fitted over her shoes. I also left the collar off and made a ruffle of the short sleeves. The fabric makes it dressy, but it's no frills for play. Her mommy made some bibs from terry cloth and scrap fabric which just needed my sewing machine to add a little touch of Velcro as fasteners. The little one finds sleepy comfort rubbing terry cloth with two fingers in her mouth. Using terry cloth backing makes great washcloth cleanups when the meals are done. 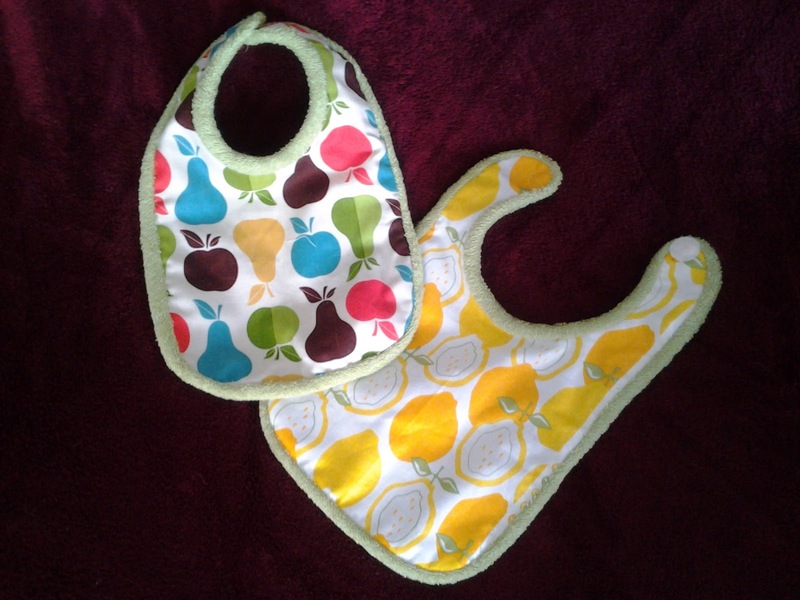 Here are 2 of the little bibs! I found adorable fabric to replace a favorite outfit that had long since become too small for our third little overseas princess. It was her favorite Grandma-made outfit, but sadly had to be passed on. To dry the cascading tears, I promised to replace her Dora dress as soon as I could. I searched in several stores before I found any Dora fabric, and was thrilled with this vivid dark shade of burgundy with blue butterflies. It is a reversible outfit, so I found some matching blue for its backing. The calendar page turned over to May while we visited the little one in a southern state. 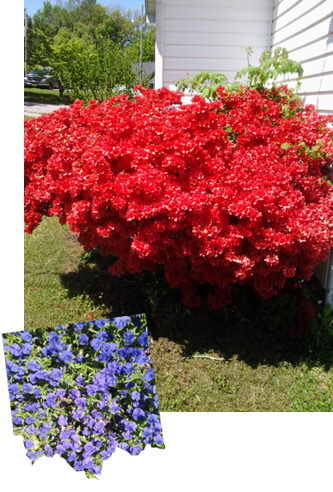 It was wonderful to see the azaleas and dogwood in full bloom and enjoy the southern sun and hospitality. We returned home on the first of May only to be met with spring rains and the predictions of SNOW (?) brought by very cold winds. 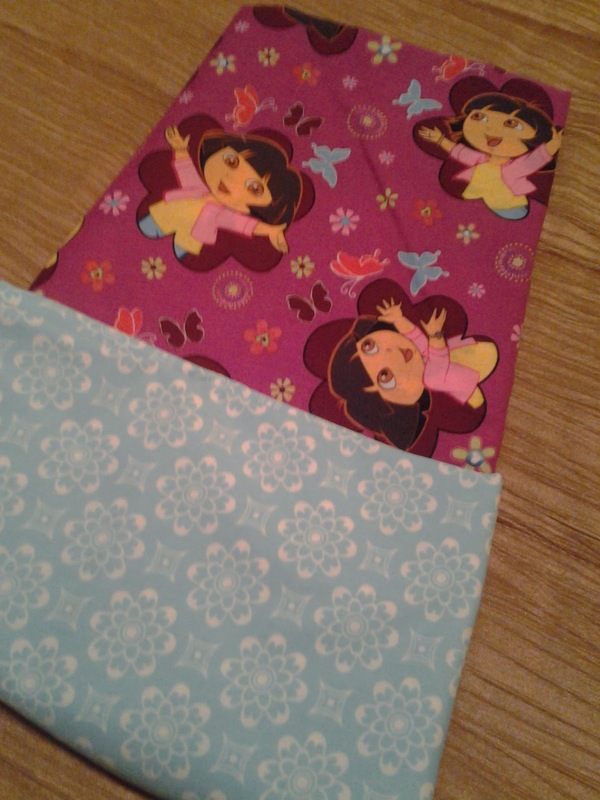 My Butterfly Garden blocks hadn't arrived yet, and it's too cold to plant the transplanted day lilies, so the rest of this week, I hope to finish the Dora dress and get it in the mail. 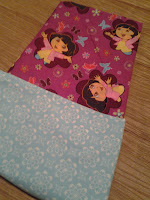 I love being a grandmother with a sewing machine! The joy of sewing somehow brings the little ones with their conversational questions and contagious giggles right into my sewing room while I dream of them receiving and wearing these adorable creations!